Earlier this summer, I had organized an "ice crawl", where we managed to go forth and sample icy treats around Houston. I figured it was a good day to spend a blisteringly hot Fourth of July. We had halo-halo and Taiwanese ice bowls, but so far, the Malaysian ais kacang and chendol have eluded me. Pictured above is the Korean patbingsu from the food court in the venerable Komart, which I fear is losing ground fast to the shinier Super H-mart. 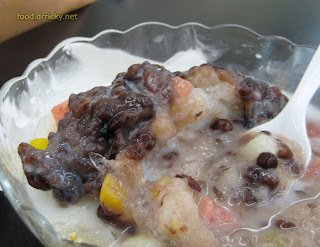 Nestled among the shaved ice are sweetened mung beans, chunks of watermelon, pieces of sweet tteok, and various other sundry ingredients. I am sure there is a version at Super H-mart as well, which I should investigate.